Enhance your Living Experience with the Visual Beauty of Custom Designed Framing! If you want the best value and the most beautifully framed art for your home visit Mount Kisco Frame Shop. Our goal is to enhance the beauty of your art. Our framing experts will work with you to design custom framing that will compliment your home decor as well as preserve your memories and heirlooms. Whether children's art, a beautiful photograph, sports memorabilia or a valuable painting we will work with you to bring out the beauty of your treasures. No matter what your budget you can be confident that we will create a beautiful design for you. We display an outstanding collection of frames including contemporary, transitional, cutting edge style as well as traditional. No matter how difficult the job we can find a framing solution. 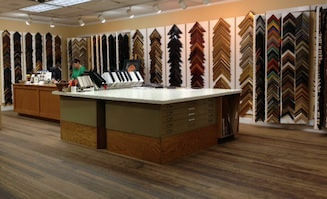 Our frame shop has been the choice of decorators for 35 years. Come visit us and see why they shop at Mount Kisco Frame Shop. We offer home delivery and private consultations by request. Our Mission at the Mount Kisco Frame Shop and Gallery is to provide exceptional customer service, apply craftsmanship to each project, and honor every customer that graces our business. We are committed to providing the most current products and practices to showcase and protect your valuables. We are mindful of the environment, and monitor how our industry stewards the earth's valuable resources. This fuels our commitment to recycling and partnering with vendors who share our vision of a sustainable future.